Ah, the wonder of escapism. Avoiding mundane things like the dishes, the laundry, feeding the kids. Honestly, if it hadn’t been for their constant whining, my kids might have starved while I read the latest romance, mystery, fantasy, thriller. Fortunately, they were strong-willed and vocal children. Now that I am a big time writer (this is a joke, the proportions of which only those who have access to my bank account appreciate) my goal is to provide escape for other people. I guess part of the reason I write is to pay it forward—a way to thank those authors who transported me to bars in Paris and Morocco, Medieval English castles, the rolling decks of pirate ships, isolated outposts in the far reaches of the galaxy, and mystic elvish hideaways. For me, the setting of a story is as important as the characters. Heck, the setting is a character. In Zoraida Grey and the Family Stones, the action takes place first in Arkansas and then in Scotland. Now, Scotland alone is enough to send a set of images streaming across the inside of my eyelids. I decided to make this series as far-reaching and atmospheric as I could. So we go from Granny’s witchy shack in the Arkansas woodland to a haunted Scottish castle with an enchanted ballroom and goblin faces inside the crystal doorknobs; a deep, icy loch; crystal caverns beneath an ancient tower; a mysterious subterranean lake; and the rocky bottom of a forbidding, ghostly oubliette. 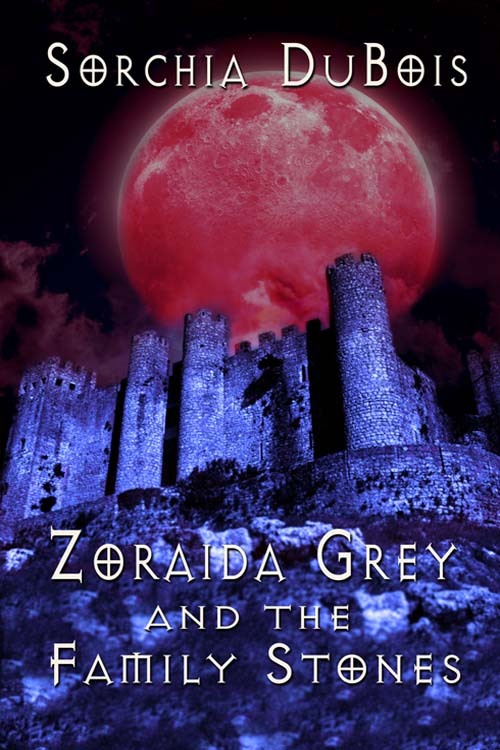 The next in the series, Zoraida Grey and the Voodoo Queen, sends the characters to New Orleans, a modern pirate boat in the Caribbean, the Yucatan jungle, an Olmec sacrificial shrine, and then back to Scotland. Oh, and to the limits of time and space as the characters practice the Craft. Of all the books I’ve read and movies I’ve seen, some of them stand out for their settings alone. More than a backdrop to a wonderful plot, these settings live and breathe with the story. The Lord of the Rings--Middle Earth! Of course it is a metaphor for pre-WWII Europe, but the place makes me want to turn Hobbit. Gone With the Wind—Pre and Post-Civil War South. Talk about a setting that lives and breathes. In GWTW, the dynamic changes in the setting fuel the story. Lawrence of Arabia—The Sahara. Never been there, but I feel as if I have. The panoramic images in the movie are breathtaking. The Hitchhikers Guide—the Universe. Not sure the ‘Verse is exactly as Douglas Adams portrays it, but he makes it sound like a fun place. Harry Potter—the Witchy world. The idea of something going on beyond Muggle perception so intriguing that I am willing to run headfirst into King's Cross Station Platform 9¾ to catch the Express. At the very least, I intend to ride The Jacobite which is the train that plays the part of the Hogwart’s Express in the Harry Potter movies. What settings do you love in books and movies? What makes a setting stand out for you? Got a quote from a book or movie that pegs a setting for you? Be sure to enter my Giveaway for a beautiful necklace of gold and Smoky Quartz. The setting of a book means a lot to me. It's my only form of travel. HA! Me, too. I plan trips and then can't afford them--maybe someday. Thanks for stopping by and commenting. Hi Sorchia, Excellent post! I enjoy reading books that are set in coastal regions, especially the eastern and western seaboards of the United States. I'm landlocked in Ontario. I hear you about the coast. I am landlocked, too, but fascinated by the ocean. Thanks so much for your comment. Your descriptions of the setting in Scotland certainly sound like a world worth investigating! I've had a bunch of fun researching and imagining the setting for Zoraida Grey. Sometimes it seems more real than my house :) Thanks for visiting and commenting. Yes! Those sweeping epics are great for settings, aren't they? Dr. Zhivago (not one of my faves) wouldn't work without the frozen steppes. I enjoy European settings the best. Must be my ancestry peeking through. Enjoyed your post! I think my fascination--some call it an obsession--with Scotland and England are rooted in ancestry. I even did a past life regression to see--if you buy into that idea. Thanks for stopping by and commenting. I would happily live in a Hobbit house. That being said, I'd have to say my favorite book destination would be Sir Terry Pratchett's Discworld. Send me there! Oh please do! And tell me I don't have to come back soon. Discworld suits my fancy! A former student turned me on to that series and I love it. Which reminds me that I have not indulged in a long time! Thanks, Laura. For setting, a favorite movie is M*A*S*H*. Really captured the camp, the mud, the blood. That it did. Especially as we watched it during the Vietnam Era. M*A*S*H had as much to do with the anti-war movement as anything and really opened eyes at the time. I remember lots of discussions engendered by the show. Thanks, Vicki, for stopping by. I love settings that I can dive right into. You named two of my favorites in LOTR & Harry Potter. Thanks, Mary. Me, too. Doesn't matter where or when as long as the author does a good job of slapping me down in the middle of it. I love books set in wilder places...ranging from places like Montana to the Scotish highlands. Something about the untouched beauty of these settings resonates with me. Oh, Laura, I couldn't agree more. As a writer, it's easier for me to write about such places than about cities. Thanks for visiting. I love to imagine the settings in my head by reading descriptions.That's part of the enjoyment of reading for me! For me, too, Patti. A little description goes a long way, so I try to keep the descriptive parts short and evocative. Thanks for stopping by and commenting. Fine, since you already took Harry Potter...sigh...I guess I'm left with the Fire Swamp in the Princess Bride with flame spurts, lightening sand, and ROUS. OMG, the Fire Swamp. NOw that is a great setting! Thanks for stopping by and commenting, Mandy. I like for the author to describe the setting and to give me some hints so I can let my imagination take over. Me, too. I've read books where the description was just too overpowering. I'd rather just get a hint of the setting and then imagine the rest. Thanks for commenting, Joye. I have not read any of your books. I will be sure to look for them! I have not read these books yet, but I look forward to reading them.